Getting roses from my husband is one of those occasions that I treasure. Unfortunately, rose bouquets wilt all too quickly, and I sorrowfully throw them away. This valentines day I decided to dry my roses so that I could enjoy them for more than just a few days. After drying them, I was really happy with the color of the white ones, but not crazy about the deep burgundy of the red ones. I used some left over spray paint from this project to color the red ones, and I was really happy with the result. The roses became a part of a this colorful front door wreath. 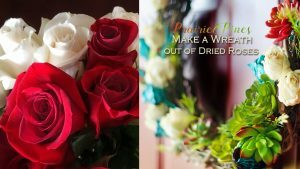 Here is the tutorial on how to make a wreath out of dried roses. 1.) 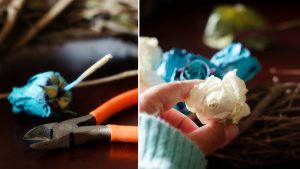 Use a rubber band to tie your wilted roses together. 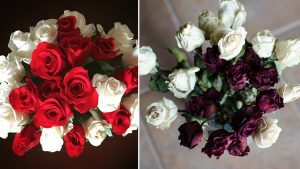 Hang your rose bouquet upside down for 2-3 weeks in a dark and dry place, until completely dry. 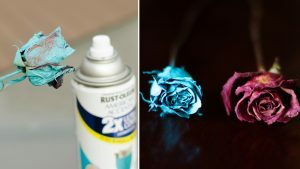 Spray dried roses with a thin coat of hairspray to preserve them. 2.) Spray paint the red roses with thin coats until they are to your liking. 3.) Clip the stems of your roses to about 3 inches long. Make sure you leave enough of a stem so that they can be inserted into your grapevine wreath. Insert a few roses into the grapevine wreath, alternating colors. 4.) 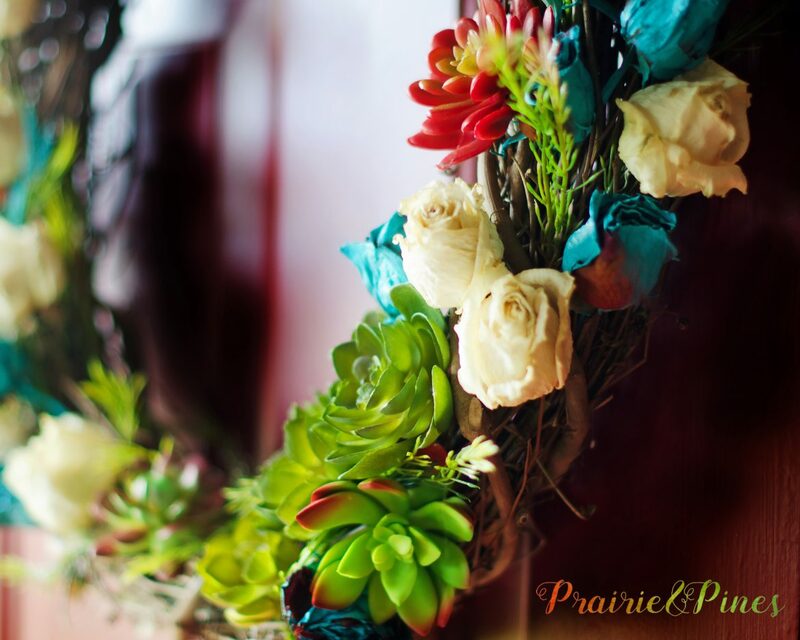 Place some succulents in a group below the roses. Continue adding roses on the other side of your succulents. 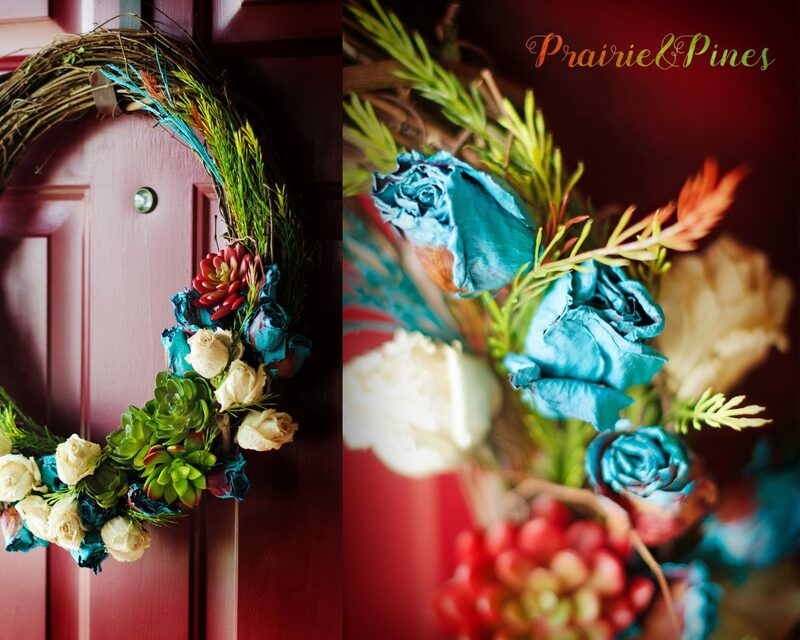 Be prepared to move your flowers around until you like the look of your wreath. 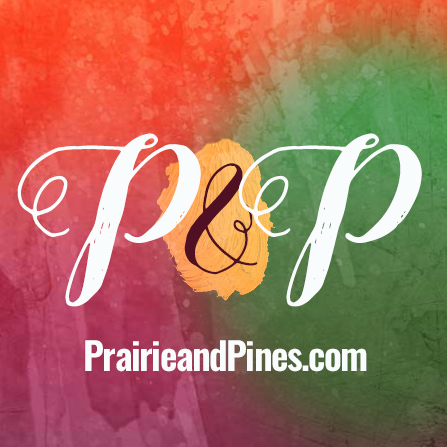 Do not glue anything onto your wreath until you are sure of the final placement. 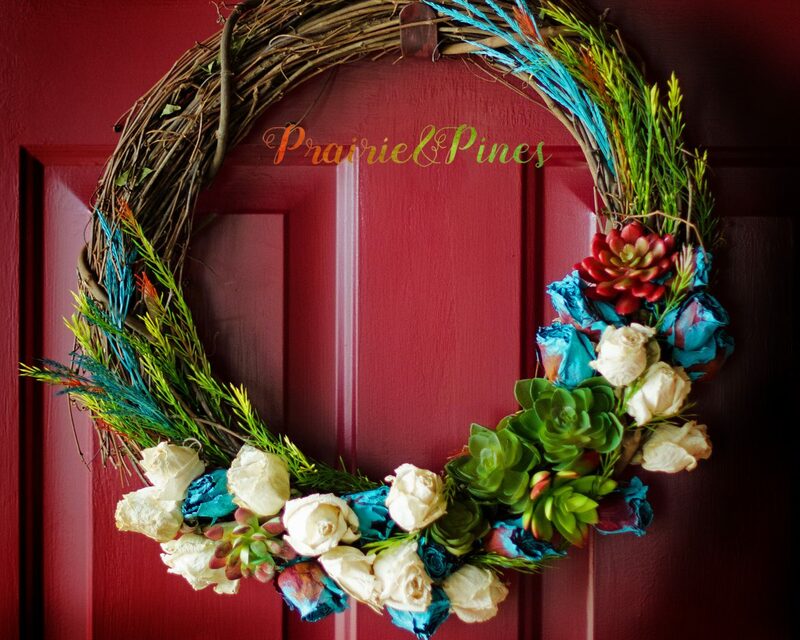 Caution: If you have storm door, adjust the thickness of your wreath accordingly, if your wreath is too thick your storm door will crush your flowers. 5.) Insert the remaining greenery into your wreath. 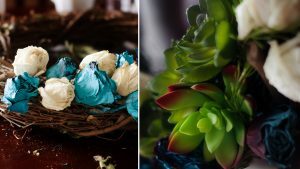 Once it looks finished, you can begin gluing the succulents in place. I found that the rose stems did not need to be glued. Hang your wreath on your front door, and enjoy! 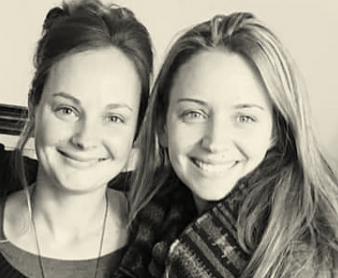 What was bound for the trash became something to treasure. A beautiful bouquet of Valentines day flowers lives on to greet my guests and brighten my entryway, something to grace the front door that represents the love within.